Be the first to share your favorite memory, photo or story of Mary Jane. This memorial page is dedicated for family, friends and future generations to celebrate the life of their loved one. 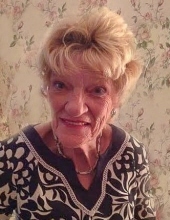 Mrs. Mary Jane (nee McCormick) Martelli, 84, died on March 25, 2018 at her home in Lansdowne, PA.
Born in Philadelphia, Jane was a graduate of West Catholic High School for Girls. She was a longtime resident of Lansdowne. Known as a legendary waitress, Jane happily served at L & M Caterers in Manoa, PA followed by 25 years at Penn Towers in Philadelphia until the time of her retirement. Jane was a member of Saint Philomena Church in Lansdowne. An avid St. Joseph's University Men's Basketball fan, Jane's greatest passion was her deep devotion and love of her family. She is survived by her husband of 64 years, Philip E. Martelli, her children, Phil Martelli, Marianne Martelli, Rosemarie Kehoe, Stephen Martelli, Christine Castagna and Lisa Jane Haney. She is also survived by her sisters, Sister Marita Jean McCormick IHM, and Nancy Dunn. She was the loving Grandmother of 17 grandchildren and 16 great-grandchildren. She was predeceased by her children, Patti Ann Phillips and Michael Martelli, and also a brother, James McCormick and a sister, Elizabeth Theilacher. Relatives and friends are invited to a visitation on Tuesday, April 3, 2018, after 9:30 AM at St. Philomena Church, 41 E. Baltimore Pike, Lansdowne, PA 19050, eulogy at 11:45, followed by her funeral Mass at 12:00 PM. Memorial gifts may be made to Camilla Hall, 1145 King Road, Box 100, Immaculata, PA 19345. To send flowers or a remembrance gift to the family of Mary Jane Martelli, please visit our Tribute Store. Camilla Hall, 1145 King Road, Box 100, Immaculata, PA 19345. "Email Address" would like to share the life celebration of Mary Jane Martelli. Click on the "link" to go to share a favorite memory or leave a condolence message for the family.